As an emerging country, there is a rapid industrial development and associated excessive resource consumption in Turkey. 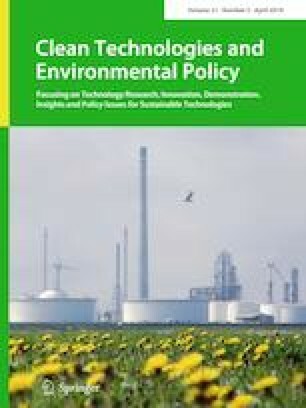 In this case, the dissemination of cleaner production activities based on the principle of minimum resource consumption and waste generation should be regarded as the priority target to ensure efficient use of the resources, enhance the manufacturing industry’s competitiveness, and reduce environmental impacts. In this paper, the potential of resource efficiency in Turkish manufacturing industry was predicted. Input saving potential in each industry and aggregate manufacturing was predicted under three different scenarios: business-as-usual, realistic, and ideal. While we used industry saving rate obtained from the field surveys in business-as-usual scenario, we used (in)efficiency scores obtained from Stochastic Frontier Analysis (SFA) conducted for the entire manufacturing industry as well as for the five selected sectors and sub-sectors by using the firm-level panel data Turkish manufacturing from 2008 to 2012 together with the sectoral saving rates. The potential of resource efficiency is estimated for five sectors: (10) Manufacture of food products, (13) Manufacture of textiles, (20) Manufacture of chemicals and chemical products, (23) Manufacture of other nonmetallic mineral products, and (24) Manufacture of basic metals. Then, it is generalized to whole Turkish manufacturing industry. The calculations were performed in both monetary and quantitative terms for energy and water inputs but only in monetary terms for raw material inputs. 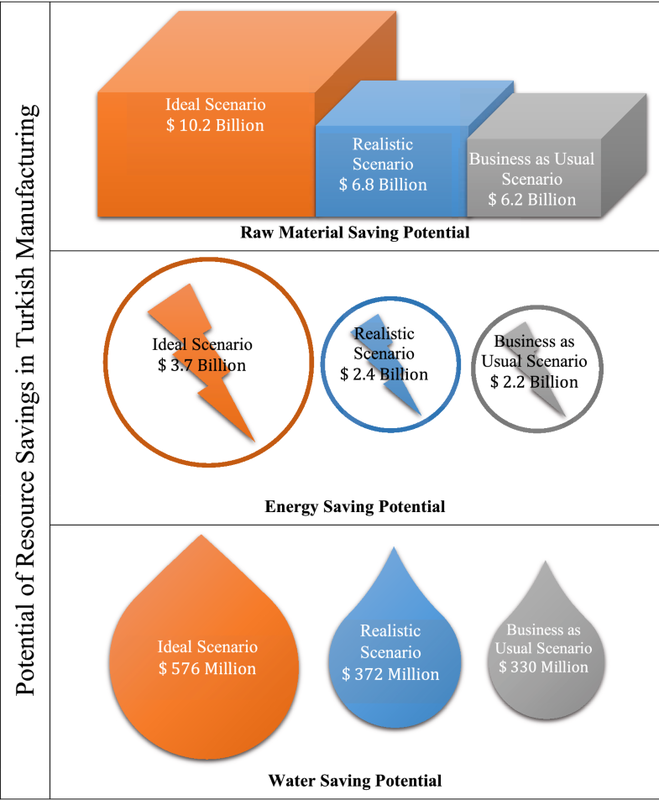 It is estimated that the Turkish manufacturing industry’s monetary-saving potential ranges from $8.8 billion/year to $14.5 billion/year based on the three scenarios specified for all inputs. In addition, according to the realistic scenario, 44.5% of total monetary-saving potential stems from SME savings (47.3% raw material, 41.8% energy, and 9.8% water). Besides, TR10 (Istanbul) and TR42 (Kocaeli, Sakarya, Düzce, Bolu, Yalova) regions have highest raw material and energy-saving potential, respectively. According to the realistic scenario, their share of the total saving value stood at 27% and 14%, respectively. Also, TR63 (Hatay, Kahramanmaraş, Osmaniye) and TR22 (Balıkesir, Çanakkale) regions have the highest water-saving potentials. To the best of our knowledge, this study is the first attempt in examining resource efficiency in the Turkish manufacturing industry in the broadest scope. Moreover, the methodology used in this work is said to be first and unique. We believe this methodology will open new avenues to the new researches both in Turkey and other countries. This work was supported by the Directorate General for Productivity, Ministry of Science, Industry and Technology [grant number 2013K100190, 2013]. The authors would like to express their gratitude for the technical supports of enterprises, sectoral experts, sectoral unions/associations and chambers of industry for the development of this work. We thank Turkish Statistical Institute (TURKSTAT) for providing the firm-level data and TURKSTAT staff for their help. All analyses have been conducted at the Microdata Research Centre of TurkStat with respect to the protocol on the statistic secret and the personal data protection. The results and the opinions expressed in this article are exclusive responsibility of the authors and, by no means, represent official statistics.